Detailed in your site survey report (details below) will be a full breakdown of the hardware required to implement your wireless network. This can be of great benefit for network managers that need to assign a budget in the future. 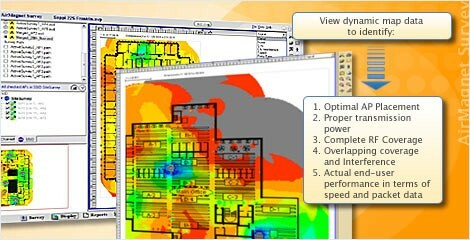 We can survey with any wireless manufacture’s hardware in mind which is essential for the network design. Utilising this detailed information we can optimise your access point channels choices of antenna’s, AP transmit power levels and locations creating a more effective wireless network for your business. Our software and techniques can be used in any environment and supports all Wi-Fi (IEEE 802.11a/b/g/n) networks. We can quickly and accurately record, visualise, optimise and report the performance of your Wireless LAN’s (802.11a/b/g/n). We can perform wireless network prediction in mapping out your RF coverage of your office, saving you the cost of initial wireless network viability test. Location of wireless Access Points, Bridges, Antenna’s and other wireless equipment. Is your wireless network not performing the way your business needs it to? Do you have interference, dropouts, poor throughput and connection issues? 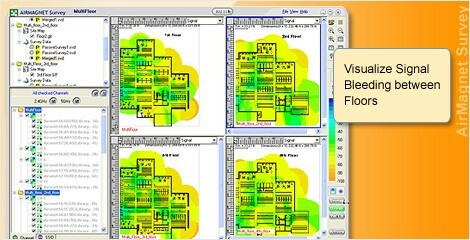 Our wireless site surveys are also an invaluable tool in diagnosing problematic wireless networks. From wireless network dropouts, discovering hidden nodes, frequency interference, rogue access points and many more hazards to wireless networks, we can ensure that your wireless network starts to perform. Performing a wireless survey on an existing wireless network is a great way to baseline your wireless performance. As the environment in which your wireless network exists is forever changing, performing a wireless health check can highlight RF issues before they become a problem.